For nearly 40 years, trucking jobs have been one of the most popular and prolific occupations in the United States. A recent study looking at the most popular professions in each state from 1978 concluded that truck driving jobs have seen popularity and perseverance over the years, and perhaps not solely in areas that one might think truck driving would be popular. Areas with rich histories in commercial driving such as Tennessee or Wisconsin are understandably still seeing strength in trucking numbers, as it were, but other areas have moved away from desk jobs to the cab of the truck. One of the reasons states such as California or Texas are seeing a spike in trucking jobs is due to the sheer number of driving opportunities offered as well as the benefits that many of these trucking companies present. While many of the traditional corporate office jobs seem to be shirking their duty of providing employees with health insurance or other benefit packages, virtually every trucking company has a benefits package to reward its drivers, one of the many incentives provided by fleets. 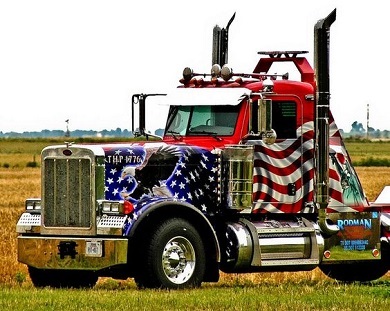 Another reason that some states or areas are seeing more trucking-related occupations sprout up is the shift in American culture towards more freedom in one's job. Many young people are looking for lucrative career opportunities that they do not find too restricting, a balance between something that will make them money and something where they can still express themselves and feel as though they are their own boss, in a sense. While many truck drivers still must answer to a manager or fleet coordinator, there is often less micromanaging in the realm of trucking. Operators have the freedom to enjoy the open road and experience the country from the seat of a rig rather than feeling as though their boundaries are limited by the walls of a cubicle. Furthermore, states such as Texas and California are finding that trucking careers mean much more than once did, partially due to a rise in industry. For the two largest states in the lower 48, natural resources are not only abundant but among the most important freight in helping the entire country. As other industries move towards the need for more chemical or energy solutions, they rely on states like CA or TX to mine for materials and for drivers to transport said materials out to the rest of the country. There are a great deal of truck driver jobs across the nation at the time being, with many more expected to arise in next few years. Many job seekers in otherwise non-traditional trucking areas are ready to find a career in the burgeoning trucking industry. For widely populated states like California and Texas who have embraced and encouraged trucking as a career, drivers will find no shortage of opportunities to fit their lifestyles. The landscape of American careers is changing and slowly yet surely, trucking careers are turning American men and women into Road Masters once again.